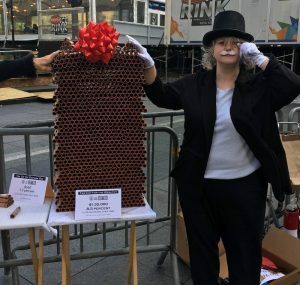 Area residents rallied outside of Rep. Steve Chabot’s Cincinnati office against budget cuts and the Republican tax plan for the rich on Tuesday, Oct. 24 (Photo: For Ohio’s Future). 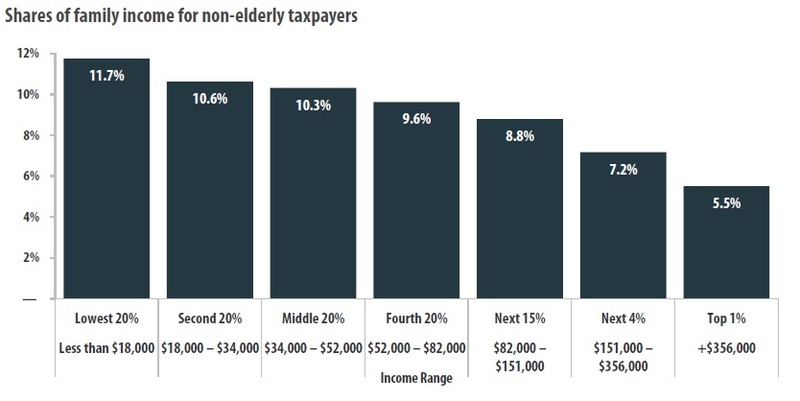 Social Security, Medicare, and unemployment insurance taxes (often called payroll or FICA taxes) are paid mostly by the bottom 90 percent of wage earners. This is because of a giant loophole for the wealthy. Once you reach $118,500 of income, you pay no more for Social Security, though the much smaller Medicare tax applies to all wages. Each of Trump’s billionaire cabinet members pays the exact same amount of Social Security taxes as someone who earns $118,500. FICA taxes make up 34 percent of all federal taxes. Almost all state taxes are regressive. Shown below is my home state of Ohio. Summary of all state taxes by income level in Ohio for 2015. (Institute on Taxation and Economic Policy). As a percentage of income, those making the least pay the most, and those at the top pay the least. State consumption tax structures are highly regressive with an average 7 percent rate on sales and excise taxes for the poor, a 4.7 percent rate for middle-income people, and a 0.8 percent rate for the wealthiest taxpayers. Because food is one of the largest expenses for low-income families, taxing food is particularly regressive; five of the ten most regressive states tax food at the state or local level. One of the things Republicans and the Trump administration want to do is end the deductions for state and local taxes. With this deduction, higher-income filers are more willing to pay state and local taxes. To balance their budgets with insufficient revenue, states and localities would likely respond by raising taxes or fees that fall less heavily on the higher-income residents most affected by the deduction’s loss. This pushes more costs down onto everyone else and would make state taxes even more regressive. If you would like to see your state’s regressive taxes, click here and scroll down to the map. In Ohio over the past 20 years, there have been two massive state-level tax cuts for the wealthy. The first was in 2005 under Republican Gov. Taft. The second happened in 2010, under Republican Gov. Kasich. After 2010, Ohio cut $4 billion from schools and local government funds. As a result, counties across Ohio raised property taxes to pay for schools. In 2016, 151 Ohio school districts had levy issues on the ballot. While this helps wealthy districts recover, it doesn’t do anything for poorer districtscontinuing a pattern of school funding inequality in Ohio. Ohio counties are not alone in using property taxes to raise money after costs were pushed downward so the state could pay for tax cuts for the rich. 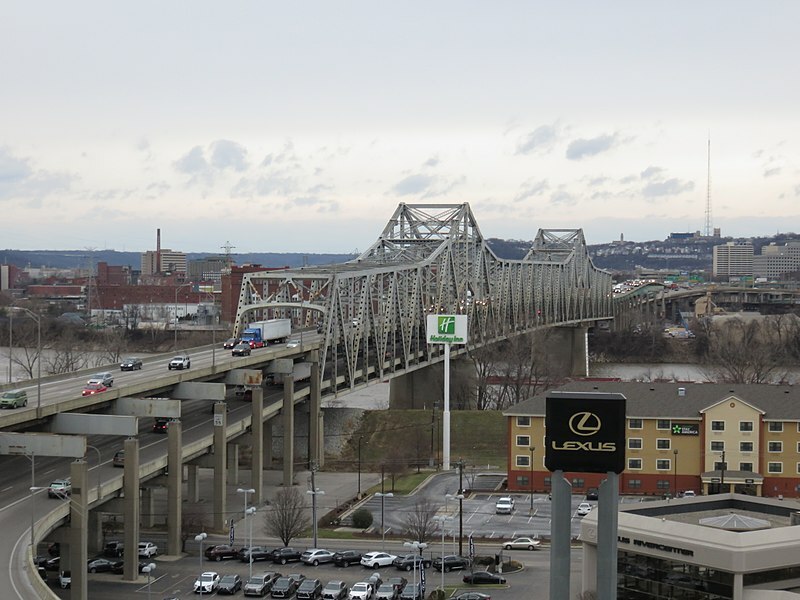 The Brent Spence bridge as viewed from Northern Kentucky in 2017 (Antony-22/Wikimedia). 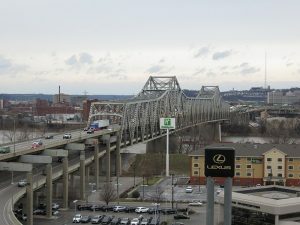 In 1998, the Brent Spence bridge, a bridge that crosses from Cincinnati into Northern Kentucky on the I-75/I-71 highway, was declared functionally obsolete. Since then we’ve been fighting with Northern Kentucky over how to pay for it. As other revenue sources have been cut, the only solution being put forward is a toll bridge. Louisville recently opened a toll bridge that everyone I know in Louisville circumvents when possible to avoid paying the tolls. This is the Trump plan for infrastructure: Private partnerships and tolls. Do you see the theme yet? Privatize the profits, and push the costs down onto average people. In Indiana, Republicans just passed 45 new fees after years of cutting taxes for the wealthy. This is also one of the reasons we’re seeing more speed cameras being installed by localities and traffic tickets being issued as the costs are passed down to local police departments. 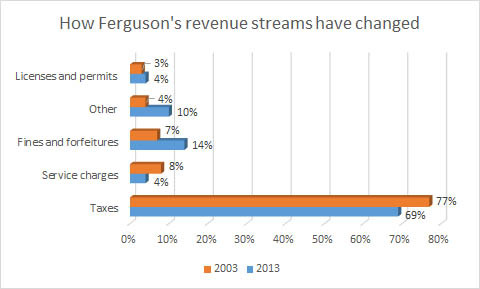 If you look at really poor areas like Ferguson, Missouri, you can see how they pass all the justice costs down onto the poor of that community. If Republicans pass more tax cuts for billionaires at the national level, look for more of the costs to be pushed downward, onto average people. Cities like Ferguson have been designed to extract everything from the poor and, if we’re not careful, everyone’s future will be similar. As part of the great tax shift in Ohio, the cigarette tax has increased from 55 cents to $1.25 a pack since 2005. While this doesn’t bother me personally because there are public health benefits, sin taxes do tend to impact those with lower incomes more. States are also raising consumption taxes (the most regressive) such as sales taxes. In Ohio, we recently saw our state sales tax increase from 5 percent to 5.75 percent in 2014. As we’ve seen revenues plummet from our tax cuts for the rich, Gov. Kasich wants to raise this another .5 percent, to 6.25 percent. On top of this, Ohio counties such as Lorain and Holmes Counties may also be adding to increased sales taxes. In 1952, corporate income taxes provided 32.1 percent of federal revenue. By 2013, corporate income taxes provided only 9.9 percent. In 1952, FICA payroll taxes provided 9.7 percent of federal revenue. In 2013, FICA payroll taxes provided 34.2 percent. Wealth taxes including the estate tax provided 19.1 percent of federal revenue in 1952. By 2013, excise taxes provided only 5.5 percent of federal revenue. What we’ve seen over the years is that every time we cut taxes for the wealthy, the costs usually end up getting pushed down onto everyone else. 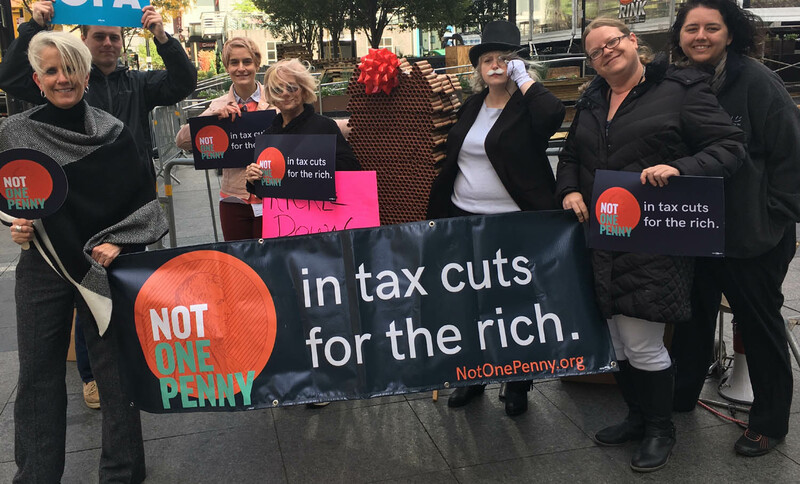 “We know that the Republican tax plan is a tax giveaway for the rich, paid for by the middle class,” said Steph Barnard from OH-1 Indivisible at the recent Not One Penny protest, which took place at Rep. Steve Chabot’s office in downtown Cincinnati. The plan is simple: it’s the Milton Friedman corporate special interest group dream of privatizing all the profits, while socializing all of the costs. If you don’t want to see these costs pushed down further onto working Americans, contact your representatives in Congress. David Akadjian is the author of The Little Book of Revolution: A Distributive Strategy for Democracy. Cross posted at Daily Kos.